@ChrisGammell, If you have not touched on it already, I have been using the Align/Distribute menu items for a recent board. It was a great help to get things in line and even. I had not noticed this in the previous release (or I was not looking in the right spot). 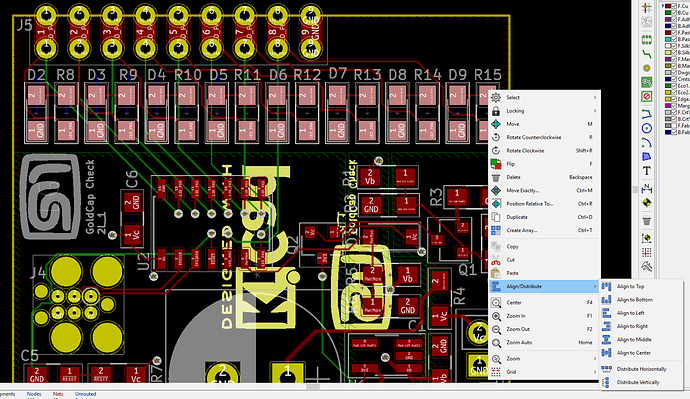 This could be one of your KiCad Two-Minute-Topics. … I also use the “Create Array” for Via stitching. I was wondering if there could be a video on setting up DRC in PCBnew. I was looking around last night and couldn’t really see a good overview of what all of my rules were. In particular track to pad, solder mask expansion, pad to pad, and fill clearance settings. As much as I dislike Altium (I use it at work), I feel like it has a better DRC interface for both setting them and then if they should be used in the project or not. Overall, it Altium provides me with more confidence that the board passes DRC since I can see all of the different rules in one place. This is likely just due to the fact that I don’t know where everything is in KiCAD. Great topics! I’ll add them to the list! No rush… it’s not like I’m waiting on you or anything! JKJK, Take your time. I think I’ve finished my four layer version, but I’m thinking I might try a 2 layer layout to bring the cost down. Haven’t decided yet. @ChrisGammell Looks like you are going to have to start the whole series over again with the release of 5.1! hahahahaha. Although I have to say that I’m loving some of the new dialog boxes. Particularly the component properties in EESchema and the board options in PCBnew.